Wellness in the Workplace - Munson Business Interiors, Inc.
A greater number of errors, inadequate care, and high turnover rates are driving healthcare workplaces to evaluate the well-being of their doctors, nurses, and administration staff. Much like their corporate counterparts, healthcare facilities are introducing their own versions of on-site services, recreation, and design elements to build a true sense of belonging and esteem. An example of this sort of leadership in healthcare is Kaiser Permanente’s “Culture of Health”, which introduced a broad range of programs to support employee well-being, including Eat Well initiatives, Mental Health & Wellness Tools, Move More Programs, as well as professional development tools focused on career development and leadership training. Other healthcare organizations are taking note of the positive change that has come from these programs and methodologies. 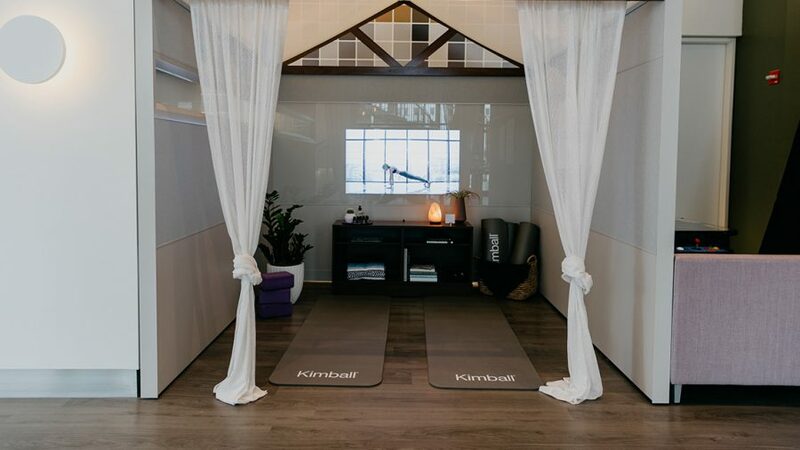 Healthcare designers are incorporating private wellness rooms where staff can retreat to rest and recharge. They are also accentuating the importance of natural light and fresh air by putting focal points on windows and making open-air courtyards available to employees. Group activities focused on physical health are being coordinated to make employees feel more connected to their peers and the organization, and access to healthier food options are being offered in cafés. Step one is focusing on the most basic needs of physiological comfort and safety—healthy food, natural light, ergonomics, privacy, and infection control. These are the key elements that support wellness, but well-being includes more than that. To elevate to true well-being and a sense of belonging, connection and social needs must be addressed, as well as esteem and self-actualization through trust, respect, autonomy, purpose, value and empowerment. Achieving all of these elements will ultimately lead to healthcare employees that are happy and healthy in both mind and body. And having happy and healthy healthcare staff means happier and healthier patients and families.